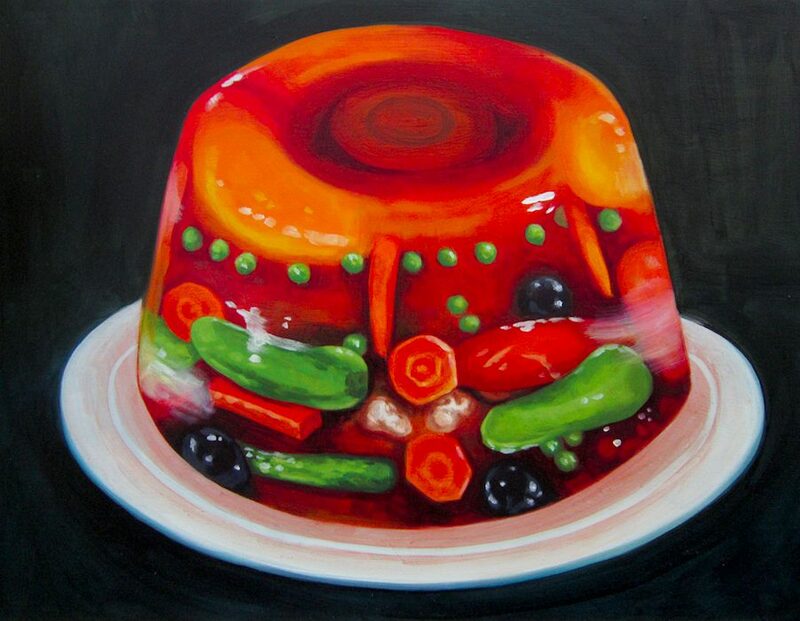 “Tomato Aspic,” oil on panel by Lina Tharsing. 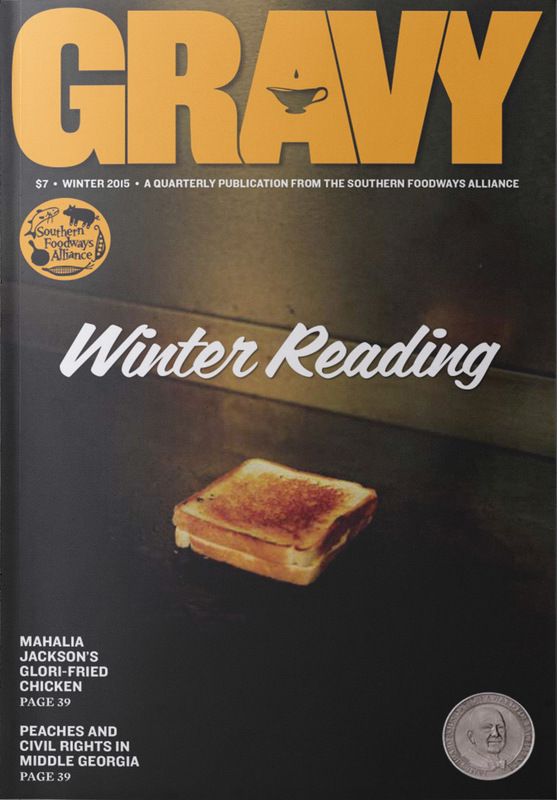 This story first appeared in the winter issue of our Gravy quarterly. The author, Lora Smith, works for the Mary Reynolds Babcock Foundation. 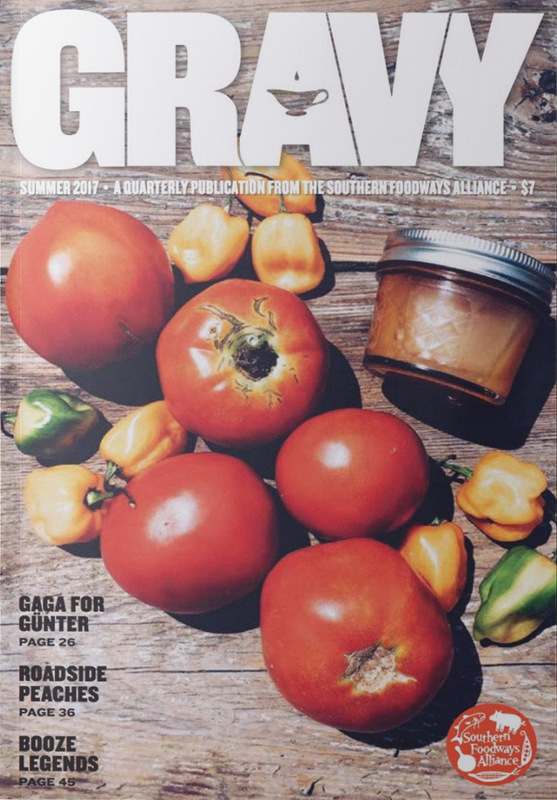 A native of Kentucky, she is a co-founder of the Appalachian Food Summit, on behalf of which she won the SFA’s 2015 John Egerton Prize. I’ve long believed in the alchemical properties of Jell-O, a powder made from ligament and bone. Add water, and all of a sudden you have a brightly colored, gelatinous solid. 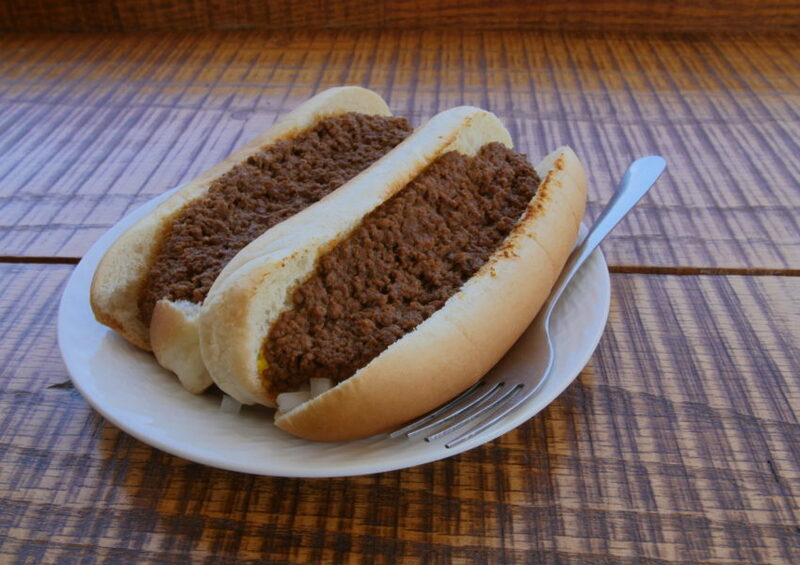 My fascination started as a child with trips to the D&W cafeteria in Corbin, Kentucky. These outings were amazing for two reasons. One, I could get anything I wanted. Two, the dessert case never disappointed. After winding around the metal counter pushing a marbled plastic tray, I was electrified by the mountains of translucent green, perfectly cubed Jell-O neatly portioned in parfait cups. Along with 7Up, a cure-all tonic in my mother’s house, Jell-O was a healing food. It was my sustenance on sick days home from school. After my second child was born, I discovered that, along with the miracle of birth and the awe of a precious new life, there was a call button I could push on my hospital bed that would prompt a Jell-O delivery. I think I pushed that button more than the one that delivered pain medication, struck by wonder each time a nurse appeared with an aluminum foil–sealed cup of orange or red Jell-O. Jell-O drove me into the archives at Berea College to explore a collection of oral histories with mountain women that documented shifting Appalachian foodways. The majority of the women were born in the 1930s and hailed from eastern Kentucky and West Virginia. The interviews highlight traditional preservation techniques, the effects of rationing during World War II, and changes to Appalachian tables over time. That all sounded fascinating, but I was there for the Jell-O. I had heard that many of the women mentioned it in their interviews, and I wanted to know why. The voices in the archives speak of hardscrabble farm living. Families grew, put up, and cooked almost all of what they ate. Every member of the family worked subsistence gardens that provided fresh vegetables. Meat was primarily chicken, pork, or wild game that they processed to store for winter. The women recall harvesting and foraging fruit from plentiful orchards and brambles. They talk about apples, blackberries, quinces, peaches, mulberries, plums, cherries, wild grapes, persimmons, pawpaws, and raspberries. Desserts were for special occasions. Holiday treats included sorghum-covered popcorn balls, buttermilk candy, fudge, and vinegar taffy. In the summer months, they baked fresh fruits into pies and cobblers. After World War II, something happened in the kitchen. 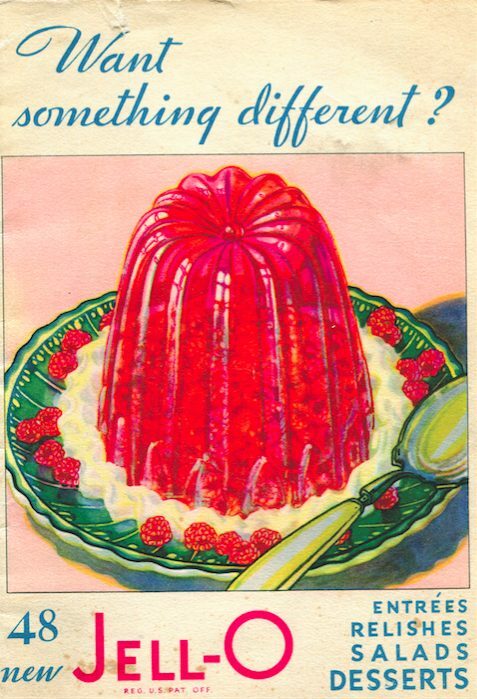 In many of the stories, Jell-O marked and divided a shift in home cooking. I came to think of time in Before Jell-O and After Jell-O eras. 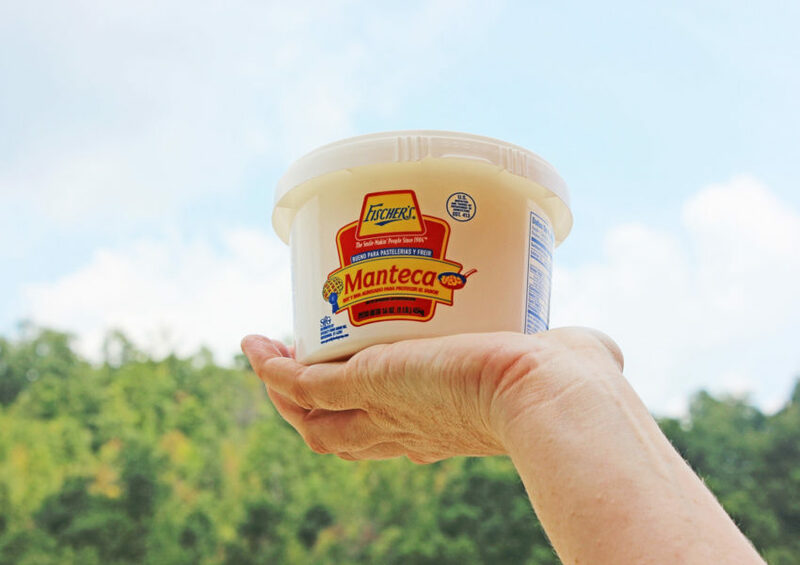 It seemed strange that Jell-O emerged suddenly as the first commercially processed food embraced by the women of rural Appalachia, especially since gelatin dishes had been popular in the United States—even in Appalachian cities—since the early 1900s. Jell-O ephemera from the collection of Margaret Dotson at the Berea College archives. The Club House Cook Book (1929), complied by members of the Charleston, West Virginia Woman’s Club, contains an extensive “Frozen Salads and Desserts” section. It features gems like Mrs. Cora Delaney Fox’s Sweet Breads Salad, an aspirational dish of equal parts sweetbreads (yes, the thymus gland of a cow), celery, and “a good mayonnaise,” held together inside a tomato gelatin mold. Reading through the interviews, it became obvious that Jell-O stood out in the minds of rural mountain women because it signaled the time when power lines finally snaked their way up rural mountainsides. The appearance of Jell-O in remote Appalachian kitchens was a direct result of rural families connecting to mainstream American culture through the very real connectivity of going on the grid. In 1935, President Franklin D. Roosevelt created the Rural Electrification Administration (REA) as part of his New Deal policies, with the goal of spreading electricity and telephone services to the country’s most rural areas. Congress authorized the entity the following year. The program offered low-interest and long-term loans to governments, farmer cooperatives, and nonprofits to run power lines to isolated areas. Kentucky was among the least electrified states at the start of the REA’s work: Only three percent of the state’s farms had electricity. Fewer than ten percent of West Virginia farms were electrified. 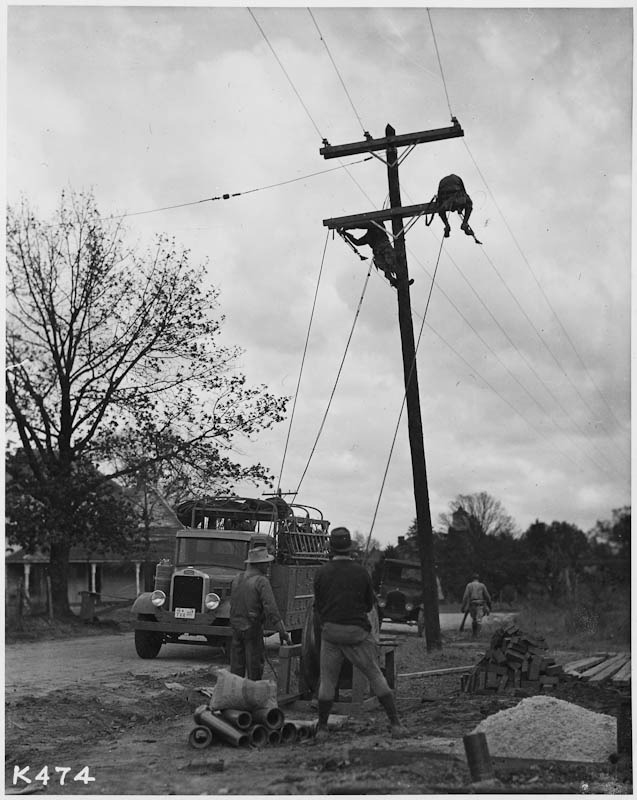 In the Berea oral history collection, most of the interviewees reported that their electricity came in the early 1950s. Prior to electricity, families used traditional preserving methods to store food for slim winters. They cured hams, canned blackberries, strung beans to dry, and fermented cabbage for sauerkraut. Families stored foods that had to be kept cold, like milk, in caves, springhouses, and root cellars. The oral histories chronicle dreadful journeys into dark caves and tales of unlucky girls falling into cold springs fetching milk jugs. Ice boxes set out on porches were an option for some rural families that lived close enough to a central icehouse. They would set out signs directing drivers up their roads on weekly delivery routes. Refrigeration changed everything about household and farm labor. 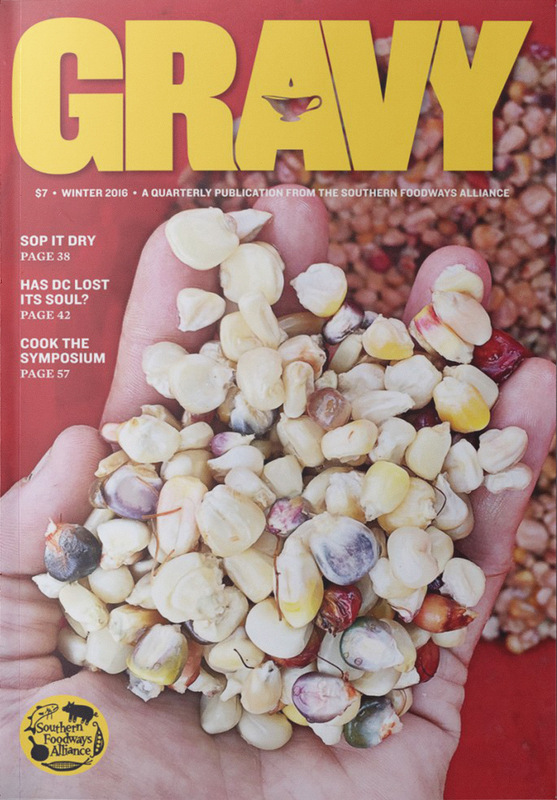 Women were no longer tied to wood stoves, canning massive quantities of produce. Now, they could cut corn and freeze it. Instead of cooking beans outside over an open fire for four hours, pressure canners could do it in thirty minutes on an electric stovetop. Community canneries and smokehouses faded from the rural landscape. Gelatin products like Sure-Jell sped up the process of preserving fruits. Among those advances, Jell-O was special. Many of the women mentioned a “fancy Jell-O salad,” reserved for holidays like Christmas, as a modern dish that became a family traditions. My home’s refrigerator runs off electricity from one of the oldest electrical co-ops in Appalachian Kentucky. And my family has a fancy red, white, and green Jell-O salad we make only at Christmas. It’s a bit of an eyesore, but I love it. A scan of my local grocery store reveals ample shelf space dedicated to a carnival of neon Jell-Os. Dubious flavors like piña colada and Jolly Rancher Blue Raspberry are hard to rectify with anything resembling a fruit found in nature. While I do believe in the magical and healing properties of Jell-O, it’s really not about the taste or texture or colors, but the context in which it’s consumed and the memories associated with it. For the farm women of eastern Kentucky and West Virginia, Jell-O was a significant marker in their lives for the convenience, modernity, and the domestic labor changes it represented. 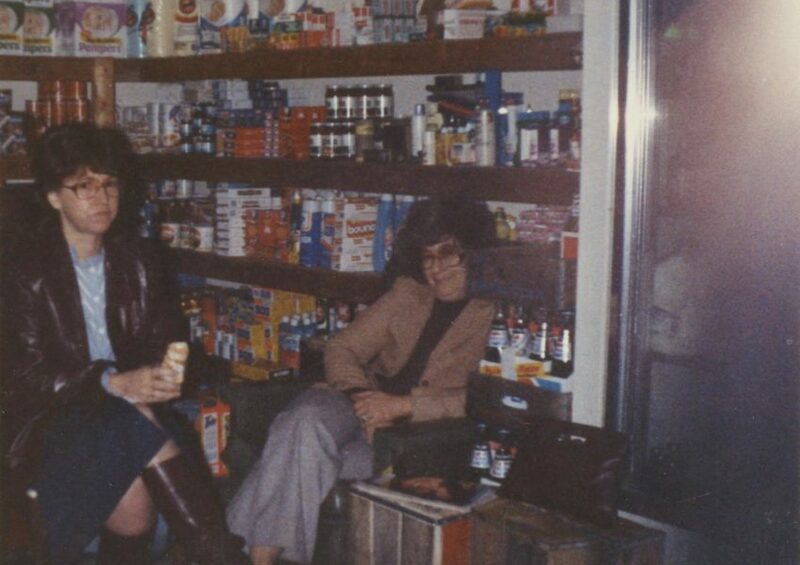 But the memories of tastes that linger on their palates and minds? Those are reserved for the Southern mountain fruits of their childhood. 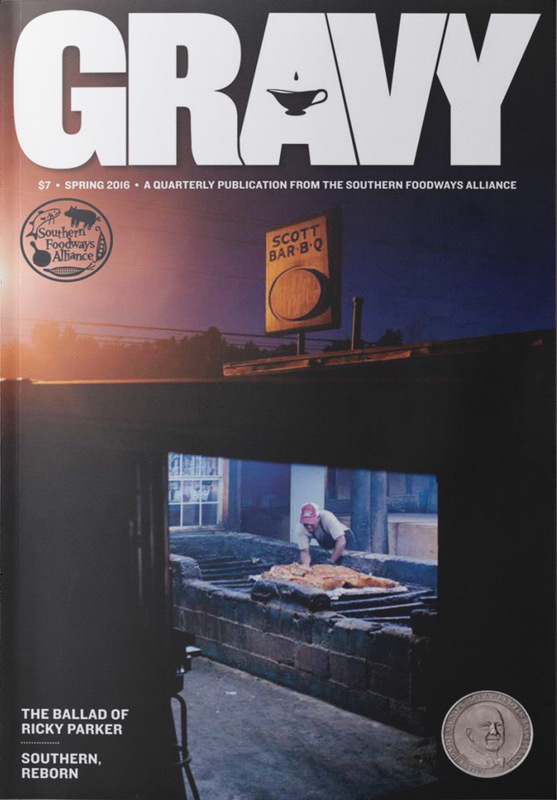 The Oral Histories in this article are used with permission from “Gathering the Stories of Appalachian Foodways: An Oral History Project” archived at Berea College in Hutchins Library Special Collections. The oral histories were conducted by Berea students under the direction of Prof. Margaret Dotson as part of her Appalachian foodways course.